Has digital technology become a necessity for Americans today? Totally. The modern digital revolution, begun in the 1980s, now dominates Americans’ lives—down to the ways they communicate, work, learn, and shop. High-earners, college grads, African-Americans, and Hispanics are among the groups of people who consider technology the most necessary to their day-to-day routines. Interestingly, the poll shows that the importance of technology in Americans’ lives depends on their socioeconomic status. Seventy-six percent of upper-income and middle-class respondents called technology crucial, while just 55 percent of lower-income people considered it so. The polling confirms what most type-A Americans already know: We’re glued to our phones, tablets, and laptops in more and more ways. Sixty-six percent of those surveyed say they use the Internet multiple times a day. Only 13 percent of the people surveyed said they check the Internet just once a day; 9 percent said never. The changes from the recent past are dramatic. Respondents log onto the Internet more often using their mobile phones (44 percent) than their home or personal computers (30 percent). They use the Internet most often to keep up with national or community news and to use social-media accounts such as Facebook or Instagram. To a lesser extent, respondents use the Internet to buy products and services for their homes or to download music, movies, books, or games. In explaining their use of social media, respondents said they mainly stay in touch with or follow the doings of family members. They don’t bother nearly as much with community or nonprofit groups, co-workers, companies and brands, or political groups and candidates. People may love the latest gadgetry, but it doesn’t always mean they can afford it. Two-thirds of respondents deemed it realistic that they could own the newest and greatest technology, but a third of them didn’t. Those who earn less than $30,000 a year were significantly less likely to say they had the dough to buy the new, new thing. The latest All­state/Na­tion­al Journ­al Heart­land Mon­it­or Poll is the 24th in a series ex­amin­ing how Amer­ic­ans are ex­per­i­en­cing the chan­ging eco­nomy. 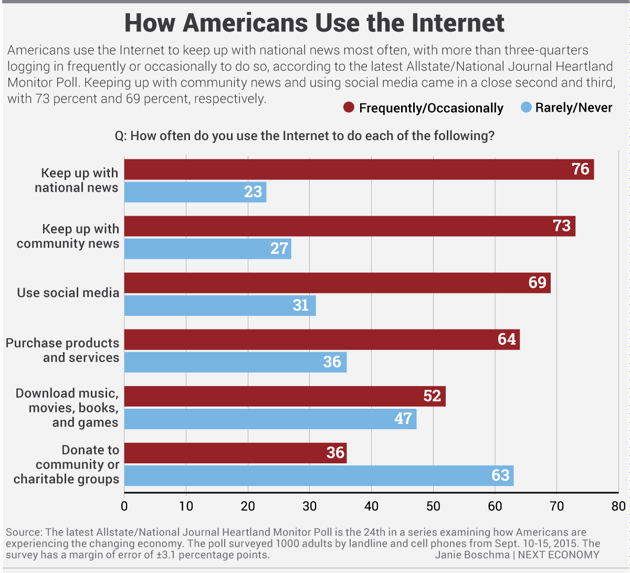 This opinion poll ex­plored Amer­ic­ans’ views on how the computer and communications revolution has changed American life, from commerce to community. The poll sur­veyed 1,000 adults by land­ line and cell phones from September 10-15. The survey, with a mar­gin of er­ror of plus or minus 3.1 percentage points, was su­per­vised by Ed Re­illy and Jeremy Ruch of FTI Con­sult­ing’s Stra­tegic Communications practice.